A romantic comedy with plenty of drama, Love With The Proper Stranger tackles weighty themes of abortion and feminism through a simple story of two lonely souls being drawn together. In New York City, Macy's pet department clerk Angie Rossini (Natalie Wood) tracks down self-absorbed but struggling musician Rocky Papasano (Steve McQueen) to let him know that she is pregnant with his baby. They only ever had a one night stand and Rocky doesn't really remember Angie, but he agrees to help her find a doctor and pay part of the fee. Rocky is a shiftless womanizer and leeching at the apartment of cabaret entertainer Barbie (Edie Adams). Angie is still living in a cramped apartment with her mother and brothers, and eldest brother Dominick (Herschel Bernardi) wants her to marry hopelessly clumsy restaurateur Anthony Columbo (Tom Bosley). Angie finally decides that she has had enough of her over protective family and strikes out on her own, renting her own place. Rocky accompanies Angie to the abortion appointment, a trip that gets quickly complicated when first they realize that they are short on money, and then have to fend off Dominick, who is in hot pursuit. The adventure brings Rocky and Angie closer, but things are about to get a lot worse when they finally arrive at the derelict location where the pregnancy is scheduled to be terminated and meet the less than sympathetic "doctor". 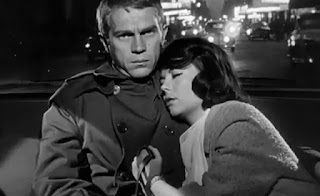 Directed by Robert Mulligan and produced by Alan J. Pakula, Love With The Proper Stranger is a small two-character study, told with plenty of heart. While some passages are slow and a few the pauses are almost too pregnant with silence, Mulligan creates a deeply satisfying dynamic between two complex characters striking out to create their own path in the world. The script by Arnold Schulman taps into several of the societal changes that would eventually rock the 1960s, and through the simple story of love blossoming between two rebels, the film finds an echo of a generation. Despite coming from a strict, traditional and loud Italian family, Angie is transitioning into an independent and rebellious young woman, insisting on making her own decisions and dealing with the consequences. Sexually liberated, she is dismissively rejecting Columbo, and then plays with Rocky's emotions to test his true levels of commitment. For the most part Rocky has already established his independence from his family and is dealing with life on his own terms. In one scene Rocky does visit his parents at the local park, and although they are thrilled to see him, he is already a stranger to them as well, just dropping in for an injection of cash. Rocky has no qualms about taking advantage of whoever is willing to help, with Barbie a particular victim, but he also cares enough about his responsibilities to help Angie when needed. Love With The Proper Stranger invests a lot of time depicting the emotional and physical horrors of back-alley abortions. Schulman's script steps through the messy hushed process of finding a doctor, the scramble to find the money, making contact with an intermediary and then walking into the room for the procedure. Every step feels like an illicit mini-nightmare and Mulligan teases out the unsustainable dichotomy between Angie's emerging societal and sexual autonomy and her inability to control with dignity what happens to her own body. Natalie Wood and Steve McQueen bring Angie and Rocky to life, and both deliver performances filled with the confidence of the young, but also capturing the awkwardness of two strangers forced into dealing with each other. Many of their scenes together include uneasy silences as they circle around a growing attraction that may be generated by the shared pregnancy adventure, or something much more life altering. Love With The Proper Stranger is an appealing romance that adds perceptive observations of a society in flux as a welcome bonus.